When someone mentions the word "turtle", most people get a basic image -- a waddling, ponderous reptile with a simple shell, and four legs and a head (with a beak) that can be retracted into that shell. Although many turtles do conform to that stereotype, there is still a wide degree of variation on that "four legs, a beak, and a shell" bauplan (basic body blueprint). 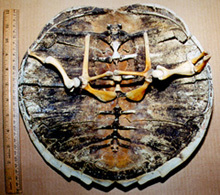 The various soft-shelled turtles such as the members of the genus Trionyx (as pictured below) have lost most of their heavy shells and replaced them with soft tissues, while the sea turtles such as the extinct Cretaceous turtle Protostega (pictured below) and the modern green sea turtle Chelonia mydas have elongated phalanges (fingers and toes) that form their paddles for swimming. Snapping turtles of the genus Chelydra have other modifications that are apparent (especially if they bite you). All of these aforementioned modifications of the basic turtle bauplan have probably enabled the turtles to diversify into a fair variety of ecological niches, which may have promoted their clade's survival for so many millions of years. 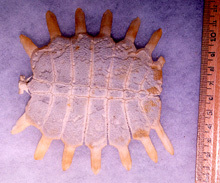 The carapace of Trionyx. 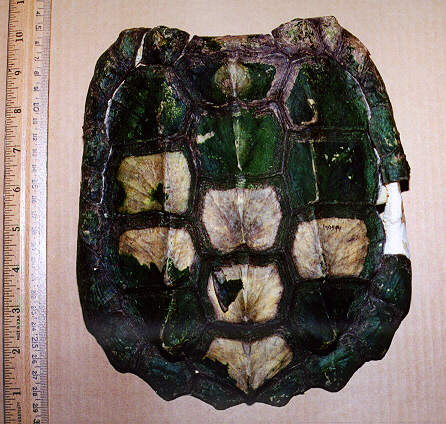 The majority of the reduction of the shell is in the plastron, on the underside of the turtle. 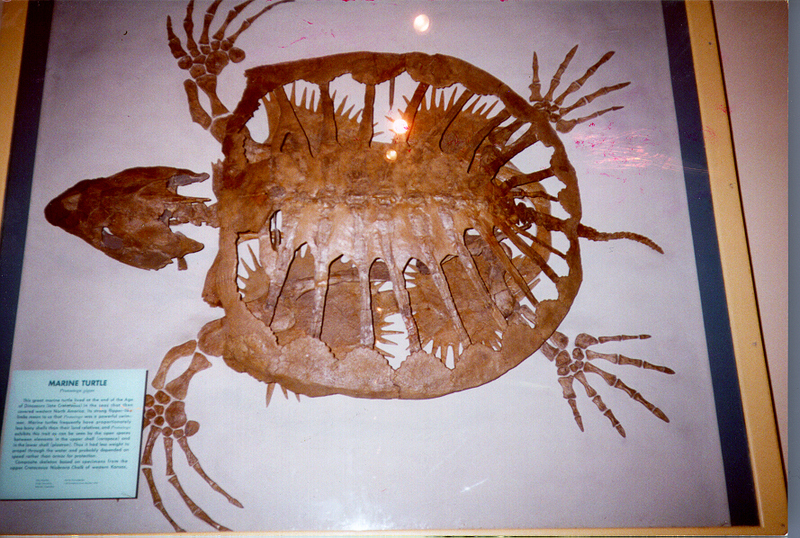 The ancient marine turtle Protostega, displayed at the Carnegie Museum in Pittsburgh. Note the reduced carapace and elongated phalanges. 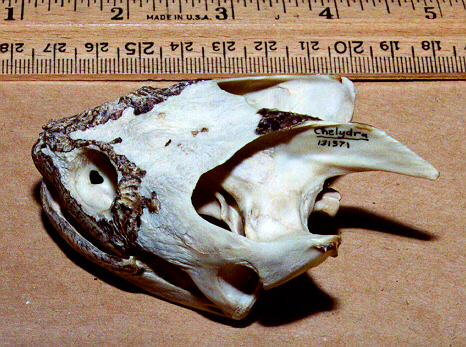 A skull of the snapping turtle Chelydra serpentina. 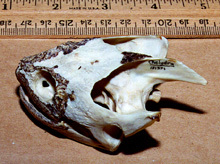 The snapper's infamously forceful bite is produced by the large jaw muscles which originate from the large dorsal crest (plainly visible; pointing posteriorly). 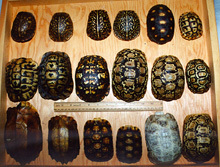 Members of the clade Testudines, of course, are most recognizeable by their tough shells, which consist of two main parts: the carapace, or dorsal (top) part, and the plastron, or ventral (underside) part. 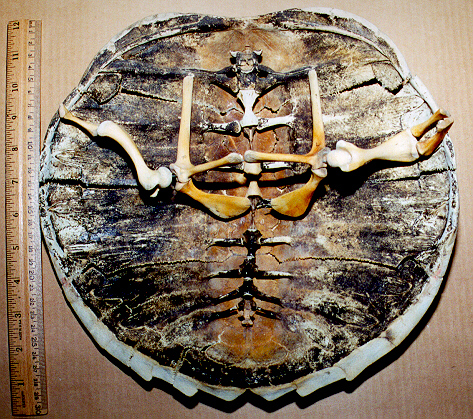 These are connected along the sides of the turtle to form the fused shell compartment. 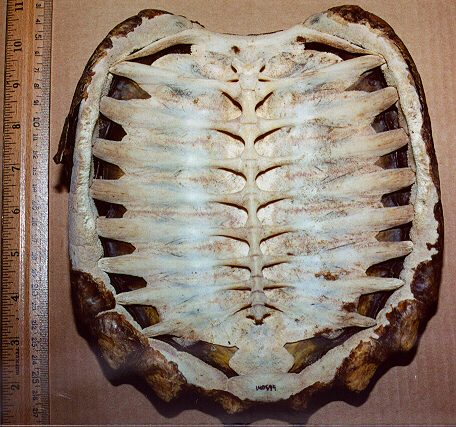 The carapace and shell (in most turtles; some have reduced these features) are formed by two main parts: the scutes (epidermal derivatives which form the outermost layer of the shell) and the bony plates (dermal -- i.e. bone -- derivatives which are the main structural components of the shell). 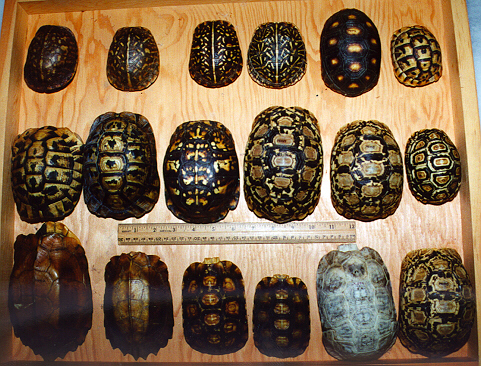 The multiple scutes overlap the bony plates, which strengthens the shell, and the scutes also are decorated with species-specific colors and patterns. The plates are fused with other skeletal elements -- plates over the vertebrae are fused with the neural spines, plates over the ribs are fused with the ribs, and the limb girdles are also attached to the interior of the shell. Each scute and plate has its own technical name, and can be identified individually (even down to a genus or species level) by turtle specialists (fossilized plates are very common fossils in many paleontological localities). 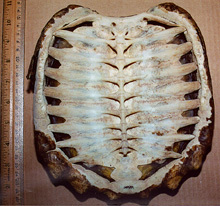 We'll spare you those terms for now; check out some turtle shell pictures below (from the UCMP collections). The shell of Chelydra serpentina, from left to right: Interior ventral view showing the attachment of the pectoral girdle to the underside of the carapace; Dorsal view of the carapace with scutes attached; and Ventral view of the carapace showing the fusion of the ribs and vertebrae to the interior of the carapace. A drawer full of turtle shells from the UCMP. Look closely at the variation in shell patterns and shapes.